Please read the following notes carefully to ensure you select the correct actuator for your turbo. You must state in the checkout 1-What Spring 2- Pison or Diaphragm. A replacement turbo actuator for vehicles based on the MK5 Golf chassis with the 2.0 FSi engine. This product is built with a predetermined actuator spring suitable for at, or slightly above factory boost levels. The actuator can be assembled with a stiffer spring upon request. We cannot guarantee compatibility with all applications, nor the ability to increase the boost output beyond a level that is within the parameters set by the engine-management-system of the given vehicle at the time of installation, whether that system is factory or aftermarket. 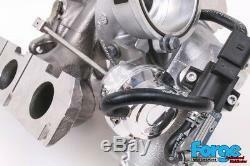 It is designed and built with the intention of increasing the boost output of a turbocharged system. Green Stock Spring Purple 13 Psi (0.9 bar) Yellow 15 Psi (1.03 bar) Blue 18 Psi (1.24 bar) Red 20 Psi (1.38 bar). The pressure figures listed above are minimum regulated pressure figures. If you are unsure please don't hesitate to message us. Diaphragm sealed internals are the default selection for this actuator product but customers now have the option of piston sealed internals. Unique to Forge Motorsport this innovation offers equal performance to the diaphragm type and low maintenance due to the hard wearing nature of piston sealed valve internals. Forge Motorsport nor any of its authorised distributors can assume any responsibility for any adverse effects resulting from the installation and tuning of this product onto a vehicle whose engine-management-system, whether factory or aftermarket, is not capable of allowing for the desired level of adjustment. While Forge Motorsport is happy to supply you with an actuator capable of holding boost beyond that of your factory unit we are in no way capable of knowing nor suggesting that your vehicle's engine or related systems are capable of supporting or surviving the stresses of such elevated boost pressure. We use DPD 24hr service. Despatch times can vary, depending on what you have ordered. But if the item is going to be delayed longer than 24 hours we will contact you. 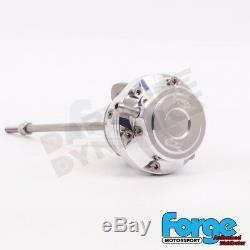 The item "Forge Motorsport SEAT LEON CUPRA 1P K04 Turbo Wastegate Adj Actuator FMACVAG06" is in sale since Sunday, March 17, 2019. This item is in the category "Vehicle Parts & Accessories\Car Tuning & Styling\Other Car Tuning & Styling". The seller is "darkside-dynamics" and is located in Gloucester. This item can be shipped worldwide.